Mighty Red Pen | Grammar, word nerds, and the editorial way. 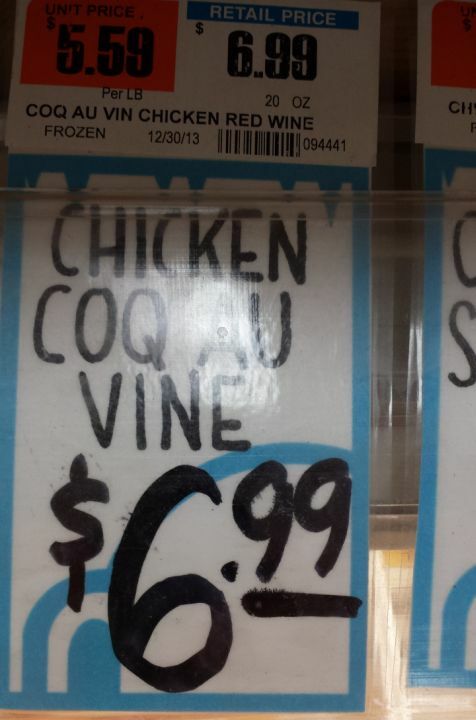 Here’s a tasty little typo that turns chicken with wine (coq au vin) into chicken with vine. Whatever that would be. I’m a little afraid to ask. And, not for nothing, it’s written correctly directly above where it’s written incorrectly. Kinda makes you want a glass of vin, no? Le sigh. Courtesy of Scott, who spotted it at a market in western New York. Here’s a trio of literary treats to celebrate today, the birthday of E. E. Cummings. 2. Over at McSweeney’s, check out the brief and amusing “YouTube Comment or e. e. cummings?” You will excuse the impertinent lowercasing of Mr. Cummings’ name (see #1). It might hurt the tummies of the livestock if you feed them. 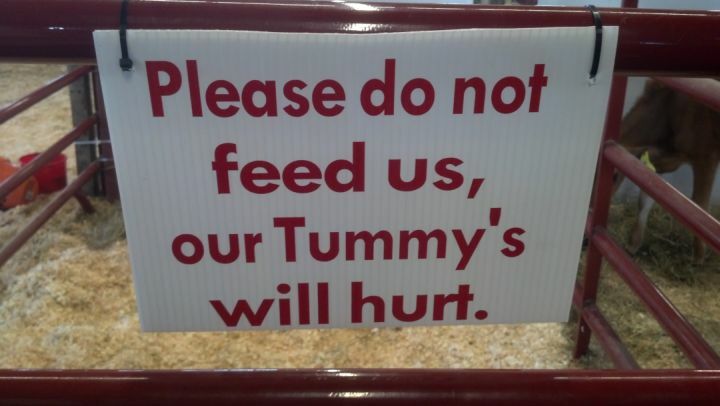 It certainly hurts word nerds to see this unwanted apostrophe in Tummy’s (to say nothing of the mysterious capitalization). Overseen at the Topsfield Fair in Massachusetts. A hoax upon both your houses! 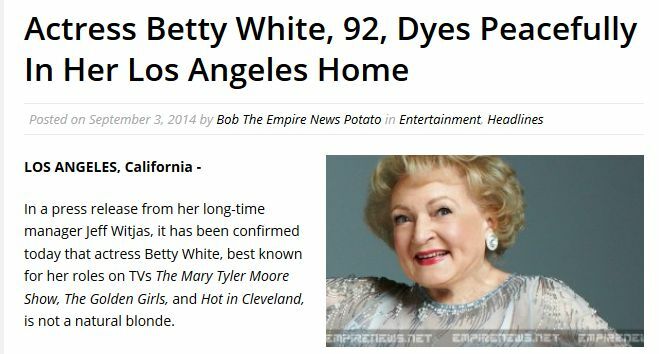 ’Cause I’m a word nerd like that, the first thing I noticed was the word dyes (“changes the color of something using a dye,” M-W) where dies (“to stop living,” M-W) would have been correct — if it was really an article announcing the death of Betty White. It couldn’t be, I thought, that Betty White had passed away and some news outlet had mixed up the spelling of this garden-variety homophone, could it? In that context, it made for a so-bad-it’s-good typo. When I clicked through the link, I found the joke was on us. News of the story traveled fast, as it does, and people began to cry “Hoax!” I started to wonder: Hoax means “to trick or deceive (someone)” (M-W), but in this case, the article never said that Betty White was actually dead. In fact, it was quite clear she was not. The only people who thought she was deceased were the people who fell for the dyes vs. dies ruse. A tricksy headline, yes, but in my opinion, not a hoax. What do you think? So you know that whole thing about how the elves in The Lord of the Rings are all, so, we’re getting in our fancy boats and sailing off into the sunset on our exclusive party cruise? Well, they said that’s what they were doing, but I think “west” must be code for “settling down in Cape Cod and opening a paddle shop.” ‘Cause look what I found. In other news, if you have not yet heard “Weird Al” Yankovic’s clever and word nerd-baiting tune, “Word Crimes,” what in Middle-earth are you waiting for? You’re welcome. Spotted this little tidbit in the dining hall of my alma mater during my recent reunion. Although kids were disappointed that the chocolate milk was unavailable, it looks like that wasn’t the only thing that was out of order. Which reunion year was it, you ask? Well, as you know, a lady never reveals any information that could lead to knowledge of her age. But not seeing any ladies around, come over here so I can whisper it in your ear: it was my tenth. Here’s a sweet little tidbit that came my way just in time for International Waffle Day today. It was spotted at a restaurant in Chicago. 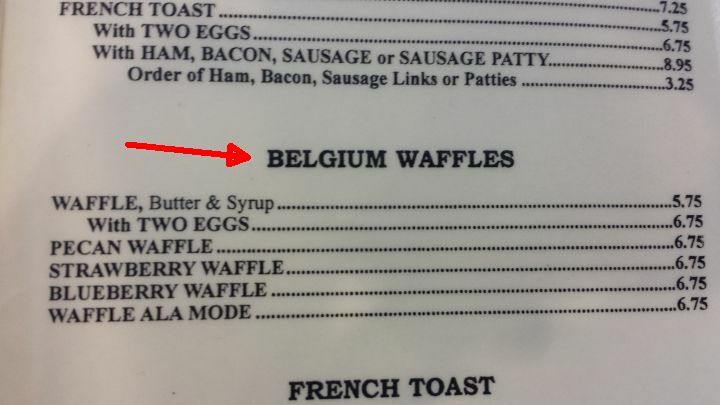 This is not an uncommon typo—I’m sure I’ve seen it a time or two (or three), and you probably have as well, so let’s iron out this confusion once and for all: it’s Belgian waffles, not Belgium waffles (Belgian being the adjective, Belgium the country). Bonus MRP moment: Today would have been Flannery O’Connor’s birthday. Her work has held a special place in my heart since I did a project in high school that involved reading everything by her that I could get my hands on and then writing a 20-page paper (a project that was admittedly easier for me than it was for friends who chose more prolific authors such as Hemingway or Twain). One of the best surprises about reading all of her works was how much I loved her collected letters, The Habit of Being. In honor of her birthday, take a listen to “A Good Man is Hard to Find” by Sufjan Stevens, which is a retelling of O’Connor’s story of the same name but from an unexpected perspective. So today, wordies, would have been the 62nd birthday of preeminent word nerd Douglas Adams. How many of us grew up reading all five of the books in the Hitchhiker’s Guide to the Galaxy trilogy? Did you make jokes about the number 42? And did you randomly say “So long and thanks for all the fish”? And do you now love to quote Adams’ sage words: “I love deadlines. I like the whooshing sound they make as they fly by.” Sure, me, too. Last summer, on my way to what turned out to be a delightful vacation in Wyoming visiting the Grand Teton and Yellowstone national parks, there was an unfortunate stop at the Denver airport (I promise this story will turn out to be about Douglas Adams—eventually). I’m not a good flyer to begin with (and yes, my worst-case-flight-disaster scenario involves sharks), and the approach to Denver was as I had been warned it would be: deeply, deeply turbulent. So, wasn’t feeling that great all around but happy to see we were about to hit the ground when the pilot suddenly—in a way that made me understand at a visceral level what the word suddenly really means—pulled the plane up and shot back into the sky. I think we all groaned at once. Finally arriving on the ground in Denver felt miraculous in a certain way, but I was so sick to my stomach I was starting to doubt I could possibly get on the next plane for the final leg the trip to Jackson Hole (in a tiny plane. Who doesn’t love a tiny plane?). I gather I missed a lot of the things there are to enjoy at the Denver airport in my airsick haze, including some kind of demonic blue horse, but as I sat down at the gate to wait for the next flight, I looked up and saw this window. I don’t know what inspired Denver airport to have a little fun with their view here, but I loved it. And between this much-needed dose of levity and the fact that I had my towel safely stowed in my bag, I really did feel much less panicked. My wordies — how time has flown! If it’s March 4, it’s National Grammar Day once again, and here’s MRP with some goodies. Just. For. You. First, h/t to one of my roving reporters for this little tidbit, spotted in Minneapolis. 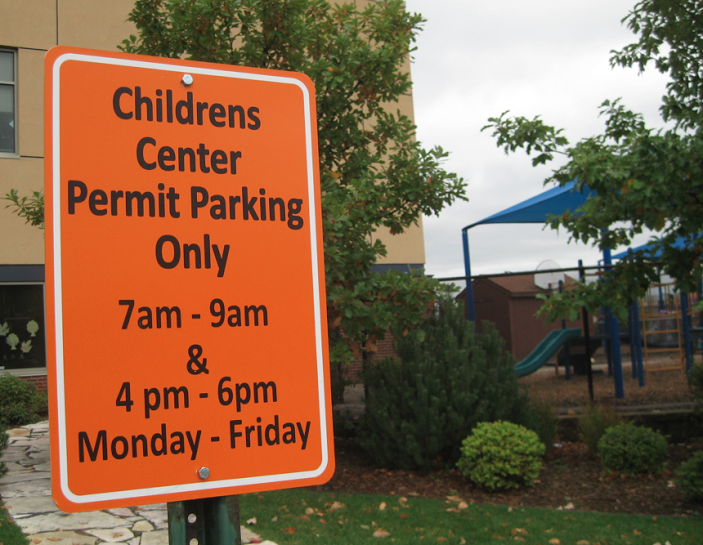 Oh dear, will no one think of the childrens and add an apostrophe to Children’s Center? Please? Next, you could do no better than to head over to the official National Grammar Day site (put together by the one and only Grammar Girl) for t-shirts, contests, free wallpaper, and other Grammar Day swag. While you’re there, you’ll want to check out this year’s installment of John E. McIntyre‘s Grammarnoir serial: “Grammar Never Takes a Holiday” (and read Grammarnoirs of years past) and get the results of Editor Mark‘s grammar haiku contest. And for real-live Grammar Day fun, check out #grammarday on Twitter. And there’s more. More! Because you’ve been so good this year, here’s the late, great Pete Seeger with his rendition of “English is Crazy” (more like English is curaaaaayzee!). You know that’s true. And if you’ve never seen this piece by poet Taylor Mali, then you’ll want to check out “The The Impotence of Proofreading,” like, now. H/t to David for that. And finally, wordies, please remember what MRP has always told you on this most special of word nerd days: You have been given a great power and with it comes great responsibility. Have mercy — do not use your ability to write grammatically correct, well-punctuated, and perfectly spelled sentences to put down and insult those who struggle mightily. Go forth and be kind to others who have made mistakes. Peeve no more — next time, the red pen may be pointed at you. Happy National Grammar Day! Visit the National Grammar Day website for resources, wallpapers, e-cards, and more. Check out the results of Editor Mark’s grammar haiku contest. Read the exciting conclusion of John E. McIntyre’s Grammarnoir serial, The Shame of the Prose. Grab a word nerdly t-shirt from Arrant Pedantry (psst—they’re having a sale). Read Kory Stamper’s well-stated A Plea for Sanity. Read one of your favorite grammar blogs (or check out MRP’s blog roll and find one you may not have known about) or follow the action on Twitter. Or make like MRP and bake some delicious chocolate truffle with sea salt cookies. Wait, what? Yeah, that’s what I said: bake some cookies. Or, if baking isn’t your thing, do something else that brings you enjoyment on this day. Because, as I’ve said before and will say again, there’s nothing about National Grammar Day that should invite us to do anything other than share in the fun (and really, what goes together better than chocolate and grammar?). So settle back with a grammartini, sing the Grammar Song, and snuggle up with your favorite style guide. And have fun. Have a happy National Grammar Day, wordies. March forth and peeve no more.